Best astronomy images 2012: See the most beautiful images of the universe. The entire universe in blog form. I couldn’t pick just 10—you have to see all 21 of these mind-bending shots. Which is interesting. It doesn’t have to be; it could be all colorless and weird and lumpy. Instead, it’s bursting with color, sculpted by vast forces, molded into fantastic shapes that please our eyes and delight our brains—especially once we understand what we’re seeing. Every December I pick my favorite images from the previous year to display, a task that is extraordinarily difficult. I always wind up with a list of about 60 or 70, and I have to cull it down mercilessly. Such is the case this year again, and I could pare it only to 21, a score and more of gorgeousness for you to soak in. I choose the pictures not just for their beauty but also because they are interesting, and different—ones that stand out from the crowd somehow. I usually put them in order with my favorite one last, but this year I just can’t. I’ll let you know my favorite when you get to it—I expect you’ll agree—but other than that it’s just a dead tie. Many of these, you might expect, are from Hubble, but other telescopes get their share, as well as some that were taken by amateur astronomers with not much more than good cameras and a desire to see and capture the Universe. I can’t argue with that sentiment. So here they are; enjoy. On Aug. 31, 2012, the Sun had a major hissy fit: A vast arch of material was lifted up off the surface by the Sun’s powerful magnetic field. Sometimes these arches collapse back down, but this one erupted, blasting literally hundreds of millions of tons of superheated plasma into space at a speed of 1,400 kilometers per second (900 miles per second)—over a thousand times faster than a rifle bullet. The scale of this is crushing—the arch was 300,000 kilometers (200,000) miles) across, 25 times larger than the Earth. As we near the peak of the Sun’s magnetic cycle, we’ll be seeing even more activity like this in the coming months. 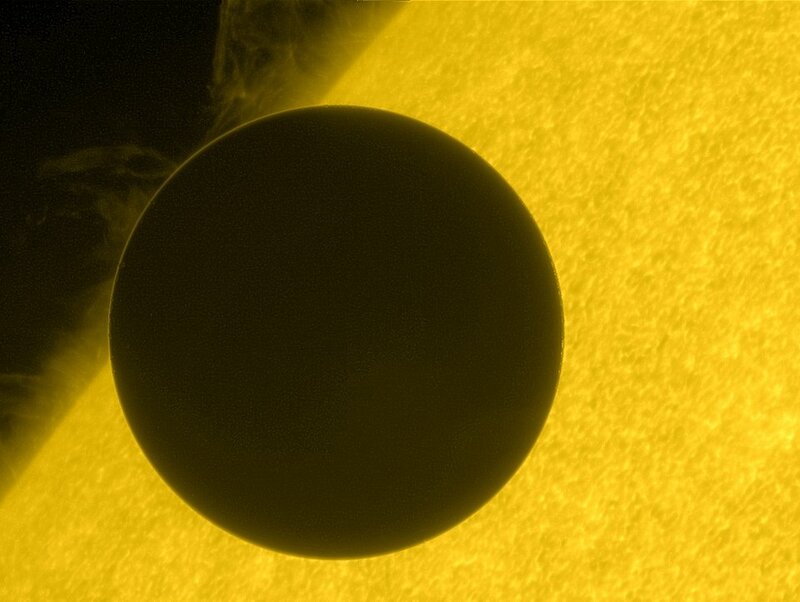 Venus orbits closer to the Sun than the Earth does, and on rare occasions our orbits align such that Venus passes directly in front of the Sun. The last time this happened was in 2004, and it happened again on June 5, 2012. Probably millions of photos of the event were taken, but one of my favorites is this view from the NASA/JAXA (Japanese Space Agency) Hinode spacecraft, just as Venus was fully entering the Sun’s disk. The Sun looks like a boiling cauldron with Venus silhouetted against it. The ring around the planet is from Venus’s thick atmosphere, scattering and bending the sunlight coming through from the other side. If you missed the transit, you’re probably out of luck: The next one isn’t until December of 2117! So you’ll have to be satisfied with pictures; I have a gallery of them, as well as a few others I liked here and here. One of the single biggest events of the year was the successful—if hair-raising—touchdown of the Mars Science Laboratory, aka Curiosity, on the surface of the red planet. The most advanced piece of hardware ever to set foot wheel on another world, Curiosity is equipped with an array of cameras, geological tools, and even a high-powered laser to zap rocks and determine their composition. 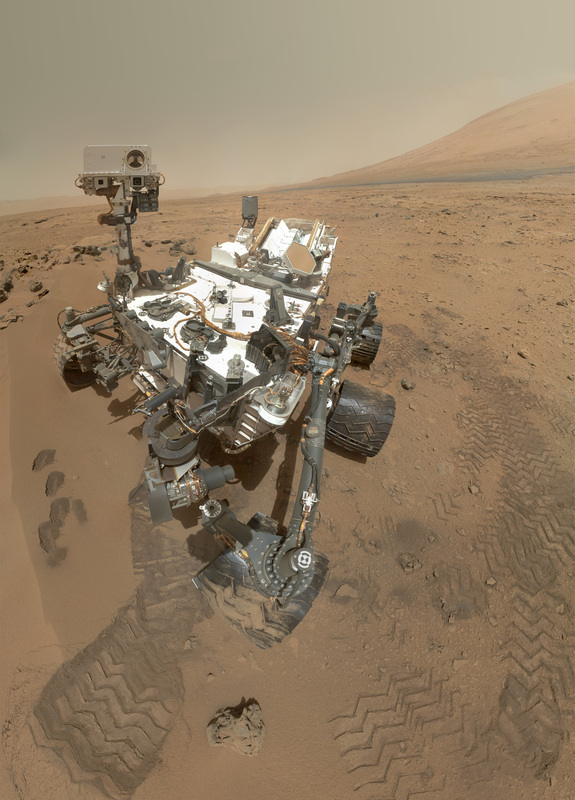 On Halloween, it used its Mars Hand Lens Imager to take 55 high-resolution pictures of itself, which were assembled to create this amazing self-portrait. The reason you can’t see the arm holding the camera is that it was essentially edited out of the final shot by careful selection of which pictures were used in the mosaic. This picture stands as proof of what we humans can do: fling a spacecraft to another planet and safely land a one-ton, laser-eyed, nuclear-powered mobile chemistry lab. Mars is an amazing place. I sometimes still think of it as cold, barren, and dead, but this is simply prejudice on my part. 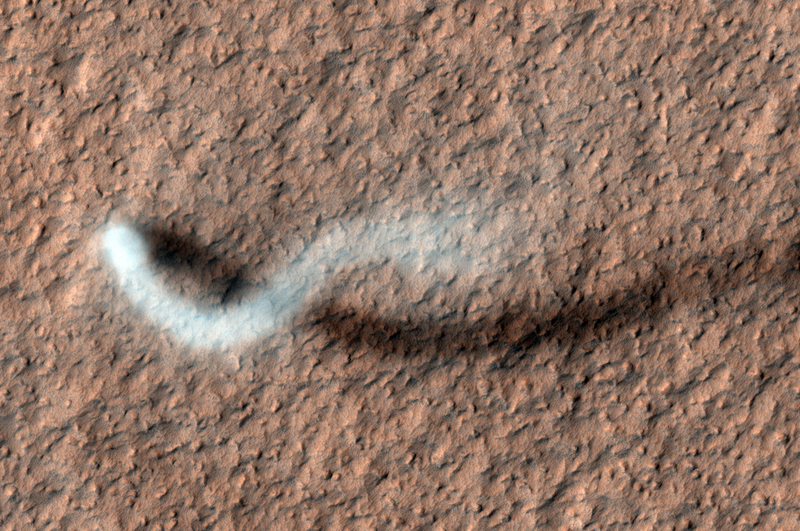 Well, it is cold, but dead it is not: It has an atmosphere capable of astonishing feats, including creating enormous dust devils—mini-tornadoes— like the one seen here by the HiRISE camera on the Mars Reconnaissance Orbiter. This towering vortex was 800 meters (half a mile) long as it swept across the ochre landscape. The plume was bent by the wind, creating that gently sweeping tail, and you can see its shadow on the ground. Dust devils form when air warmed by the ground below rises. If there’s a steady wind it can wrap the rising air into a vortex that can tip vertically and swirl around. They’re common on Mars, but one this big is unusual … though not long afterward, another one formed that was a staggering 20 kilometers (12 miles) high! Saturn is most famous for its magnificent rings and bizarre fleet of moons. But the planet itself has some major weirdness going on as well. Saturn is a gas giant, with a tremendously thick atmosphere that is tens of thousands of kilometers deep. At its north pole there is a hexagonal vortex, a swirling system of clouds and storms 25,000 kilometers (15,000 miles) across—twice the size of the Earth! In the very center of the hexagon is a circular weather system, the Eye of Saturn, seen here by the Cassini spacecraft. You can clearly see storms clouds rising above the cloud deck, and the detail is phenomenal. This feature is about 2,000 km (1,200 miles) across—two-thirds the length of the United States. IC1396 is a huge cloud of gas and dust, a star-forming factory 100 light years across. Massive, hot, young stars in the center have blown an enormous cavity in the center of the nebula, their fierce stellar winds and blasting ultraviolet light eating the cloud away from the inside out. J-P Metsävainio is a Finnish astrophotographer who took several images of this sprawling cloud, broke them up into layers, made a computer surface model of the structure, then remapped it all into different frames seen from different angles. The finished product is this jaw-dropping three-dimensional animation. I’ll note this is an approximation to the real structure of the nebula, an educated guess. But it gives an incredible feel to the object and a real sense of what it must really be like. (Image credit: J-P Metsävainio). When humans are babies, they tend throw lots of tantrums and, um, spew material out of both ends. Stars do that too: Meet Sharpless 2-106, a baby star just getting its start but still capable of throwing epic fits. At 30 octillion tons, it packs a bit more oomph than your standard human baby! You can see it in this Hubble Space Telescope picture just below center. 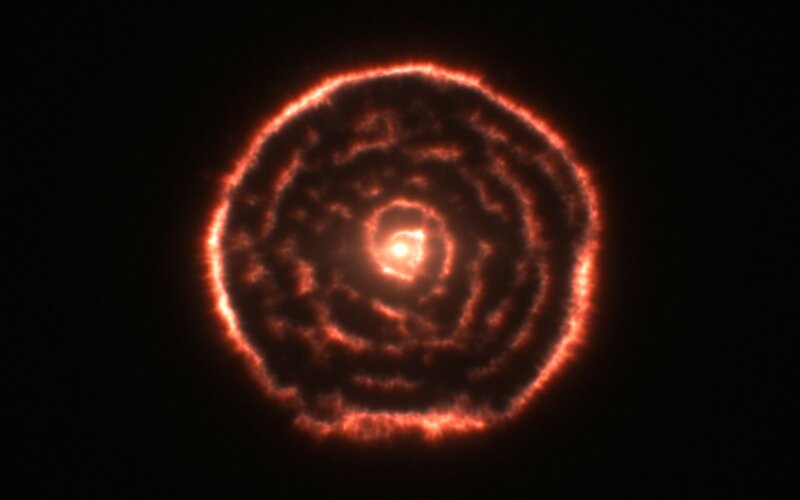 Like many young stars, it has a disk of material swirling around it (too small to see here), and this can focus twin beams of matter and energy which blast away from it like the beams of a lighthouse. This expanding material slams into the surrounding cloud of gas and dust, pushing it aside and creating the hollowed-out region you can see in blue. The actual process is fairly complex and not perfectly understood, but what’s not hard to understand is the terrible and stunning beauty of this scene. In fact, this picture is so gorgeous it inspired my friend, space artist Lucy West, to paint it, and the results are remarkable, to say the least. Hubble: NASA, ESA, and the Hubble Heritage Team (STScI/AURA). In astronomy, as in life, what you see depends on how you see it. Our eyes are sensitive to visible light, a very narrow slice of the electromagnetic spectrum. When we look at M78, a cloud of gas and dust near Orion’s belt, we see only the material that emits or reflects visible light. Interstellar dust, thickly spread throughout the region, is cold and black. But if you had infrared eyes, that dust would glow with thermal light in the far, far infrared. The APEX telescope is designed to see that light, and when combined with a visible light image from the Digitized Sky Survey, you get the incredible picture above. The APEX shot is colored orange, so what looks black to our eyes glows like fire in this image. 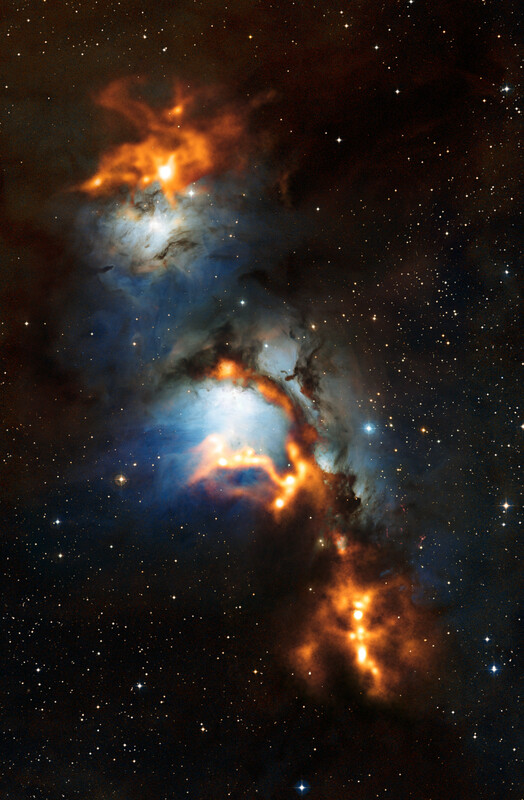 The bright knots of light are where new stars are being born, enshrouded in thick dust. If all we could see was visible light, those stars would be completely invisible, and we’d be missing the best part of the show. ESO/APEX (MPIfR/ESO/OSO)/T. Stanke et al./Igor Chekalin/Digitized Sky Survey 2. Deep in the heart of the galaxy Hercules A is a monster black hole. Vast amounts of material are falling into it, swirling in a disk that’s heated to millions of degrees. The disk is so hot in the center that material wants to expand violently and blow away. Magnetism, friction, and other forces focus that expanding material into twin beams which blast out of the poles of the disk with such speed and ferocity that they travel for hundreds of thousands of light years before finally slowing down and puffing out into twin lobes of matter. 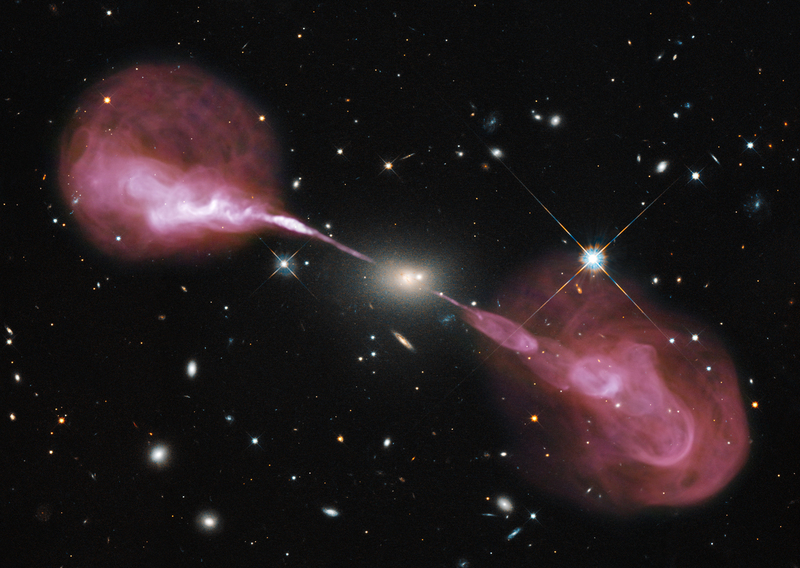 This image is a combination of observations from the Hubble Space Telescope—which shows the galaxy Hercules A, stars, and background galaxies—and the Karl G. Jansky Very Large Array, which detects the radio waves emitted by the jets and lobes. The structure is well over a million light years end-to-end, but what else would you expect from an object whose central engine is a black hole with 2.5 billion times the Sun’s mass? NASA, ESA, S. Baum and C. O'Dea (RIT), R. Perley and W. Cotton (NRAO/AUI/NSF), and the Hubble Heritage Team (STScI/AURA). Astrophotographer Stéphane Guisard took this remarkable picture of Orion rising over the Temple of Kukulkan in the ancient Maya city of Chichen Itza. The temple is 30 meters (100 feet) high, a monument to the architectural savvy of the Maya. In Orion you can see the orange glow of Betelegeuse, bright blue Rigel, and the fuzzy pink glow of the Orion Nebula (below the belt), a star-forming nebula over 1,000 light years away. The image you see here is nothing short of mind-blowing, for any number of reasons. Called the Hubble Extreme Deep Field, it’s a combination of 2,000 separate exposures by the orbiting observatory for a total of over two million seconds, or 23 days! For another, nearly every single object you see in that picture is actually a galaxy, a vast collection of billions of stars. Yet this region of the sky was chosen for this observation specifically because it was previously thought to be relatively empty! Hubble’s sharp and sensitive vision reveals that the Universe, no matter where you look, is never empty. 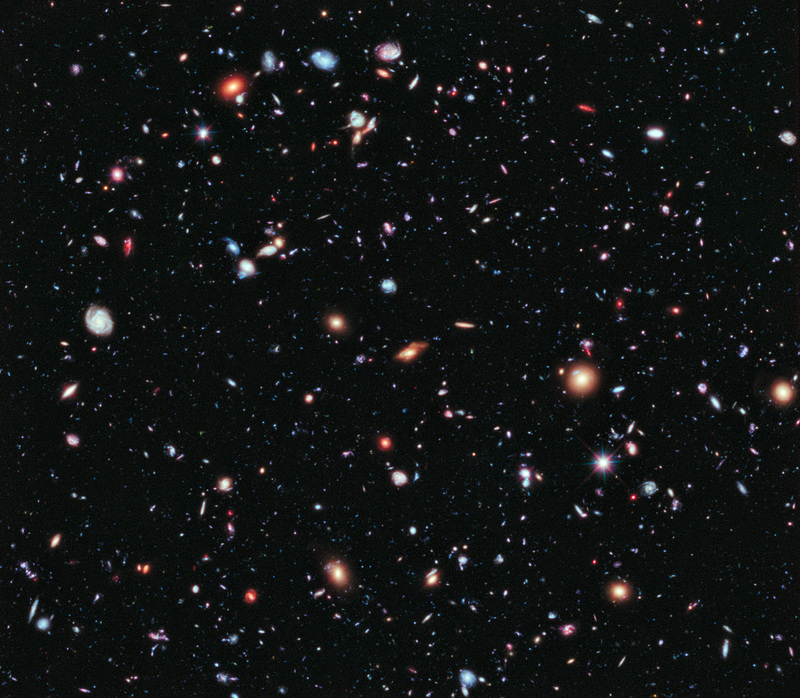 Extrapolating from this image to the rest of the sky, it means there are hundreds of billions of galaxies in our Universe, most, like those seen here, billions of light years away. The current record-holder for most distant galaxy ever seen was detected in this picture as well. It’s a profound and thought-provoking picture—a common characteristic of astronomical images. NASA, ESA, G. Illingworth, D. Magee, and P. Oesch (University of California, Santa Cruz), R. Bouwens (Leiden University), and the HUDF09 Team. On March 28, 2012, photographer Helge Mortensen was in Tromso, Norway on a mission to capture the aurora borealis, the northern lights. He succeeded magnificently, taking this beautiful shot of the eerily-glowing green lights over the icy landscape. You can see the Moon, Venus, Jupiter, and the Pleaides cluster in the picture as the particles from the solar wind slam into Earth’s atmosphere, lighting up atoms of oxygen and nitrogen. I also like the water flowing in the bottom part of the shot; in the 10-second exposure it forms a soft, smooth surface. By coincidence, one part of it forms a pattern remarkably like a face, an aquatic Shroud of Turin. Can you spot it? Photographer Randy Halverson took this moody picture of the Milky Way rising behind the iconic silhouette of Devil’s Tower in Wyoming, known to countless dorks like me as the location of the alien rendezvous in Close Encounters of the Third Kind. Halverson is amazing, and his time-lapse video “Temporal Distortion” is well worth your time to watch. For sheer beauty, there is little in the sky to match a magnificent open-armed spiral galaxy. This is NGC 5033, which is located 50 million light years away from Earth. That’s relatively close by cosmic standards, allowing us to get a good peek at it even though we see it at a low angle. Accomplished astronomer Adam Block took this image using the 0.8-meter Schulman Telescope on Mount Lemmon in Arizona, and it’s a total exposure of 13 hours. You can see the combined glow of billions of older, redder stars in the center, and the blue light from younger stars being born in the arms—the pink blobs festooned on the arms are gigantic nebulae, clouds of gas and dust, where stars are being born and lit from within by those stars. The oddly distorted shape to the arms (together with some other unusual features) makes me think NGC 5033 recently had a close encounter with another galaxy, its gravity warping the shape of the spiral. That’s actually pretty common in the life of big galaxies like this. It’s a dangerous Universe out there. Adam Block/Mount Lemmon SkyCenter/University of Arizona. Massive stars do not go gentle into that good night; they rage, rage against the dying of the light. In fact, they do more than rage: They explode. A hundred centuries ago, a far-away star did just that. At the end of its life, the forces inside it tore it apart, detonating it, blasting away the star’s outer layers in the most violent event in the Universe: a supernova. 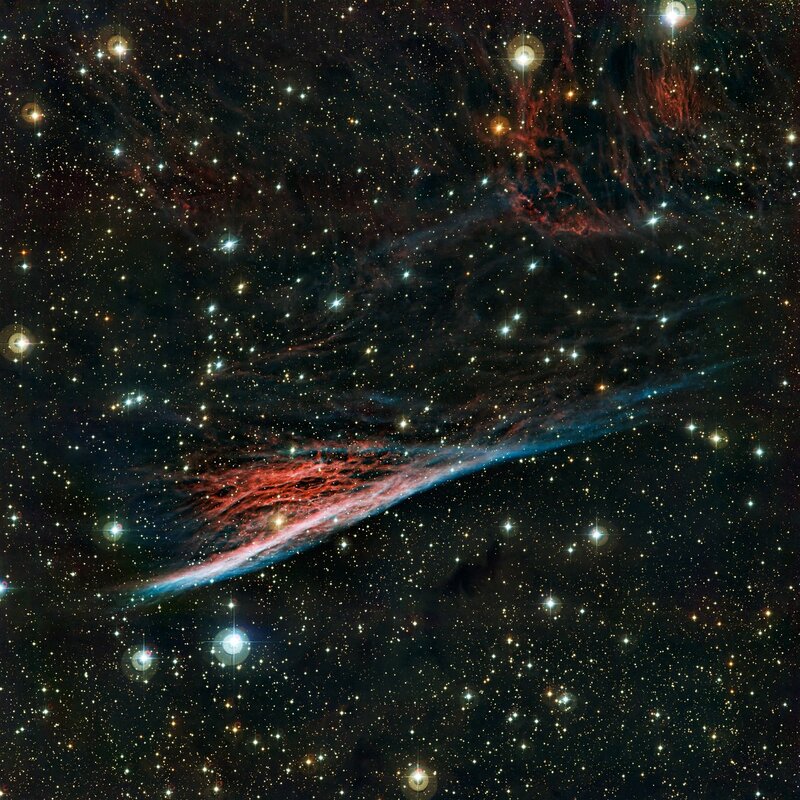 What you see here is called the Pencil Nebula, one small part of the vast Vela Supernova Remnant, what was once a star but is now an ever expanding cloud of gas. Material from the explosion is moving outward at thousands of kilometers per second, slamming into gas floating in space, compressing it and causing it to glow. The colors in this picture, taken by the Wide Field Imager on the MPG/ESO 2.2-meter telescope, represent different elements: Oxygen is blue, and hydrogen red. Mixed in there are also elements like iron, nitrogen, carbon, and more. These are essential for life as we know it, and in fact all the iron in your blood and calcium in your bones were created in stellar explosions like this one. You are, very literally, made out of the ashes of stars long—and violently—dead. If you asked a space nerd what the ultimate picture would be, they would say one that has a rocket, a laser, and the aurora in it. Behold! Your wish is granted. (If it had a T. rex eating bacon it would be too awesome to even gaze upon.) This picture, taken by Lee Wingfield, shows a rocket launch on Feb. 18, 2012 from a launch facility near Fairbanks, Alaska. The rocket carried an instrument on board to measure how the Earth’s magnetic field interacts with storms from the Sun that cause aurorae. The laser is a nice touch, but also has a scientific purpose: It can be used to measure the properties of the atmosphere at different heights, dovetailing with the observations made by the detector on the rocket. Experiments like this will help scientists understand the phenomenon of “space weather,” which can affect satellites in orbit and our power grid here on Earth. But also? This picture is just pure awesome. In late 2011, a new comet was discovered. Named Comet Lovejoy (after its discoverer), it has an orbital period of more than 600 years, and at closest approach to the Sun skims right over the surface of our star at a distance of 150,000 kilometers (90,000 miles). It reached this point in its orbit in December, and most people thought it wouldn’t survive … but it did. And as it pulled away from the Sun, the intense heat blew a magnificent tail from the comet that extended for millions of kilometers. This picture, taken in late December 2011, shows the comet rising in the pre-dawn sky next to one of the domes of the European Very Large Telescope in Chile, which was using a laser at the time to help it focus on its astronomical target. The Moon and Milky Way punctuate this shot, as well as the stars Alpha and Beta Centauri. If you follow the tail down, you’ll see it get redder nearer the horizon, which is due to dust in our own atmosphere scattering away blue light from the comet, leaving only the red to get through to our eyes. Stars are born in clouds of gas and dust that collapse (perhaps when they collide with each other, or a star nearby explodes and compresses the cloud). These nebulae can be small, enough to form a single star, or huge, forming thousands. The Carina Nebula is one of these monsters: Even from more than 7,000 light years away, it’s bright enough to see with the unaided eye. This stunning image is from the VLT Survey Telescope and shows very nearly the entire cloud, a span of about 100 light years. ESO. Acknowledgement: VPHAS+ Consortium/Cambridge Astronomical Survey Unit. 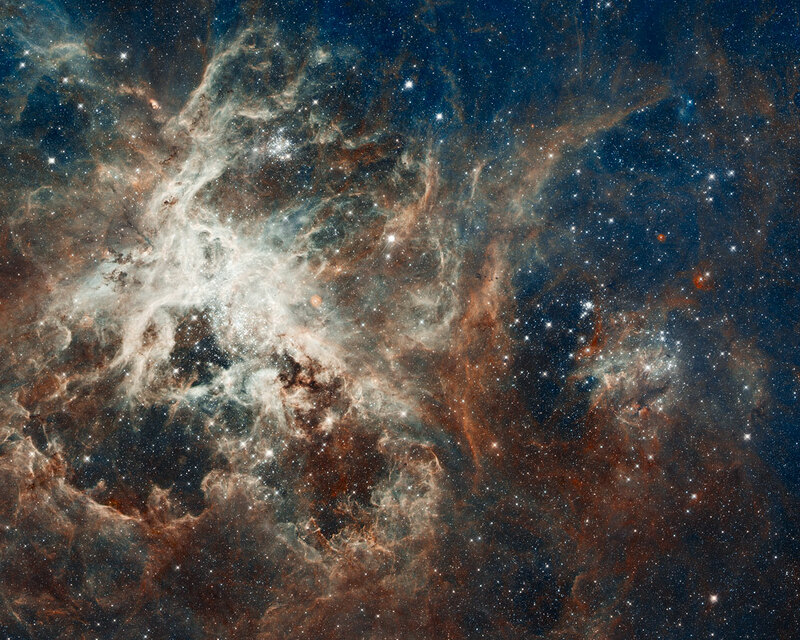 30 Doradus is another vast star-forming factory, and this image is Hubble’s view of it. 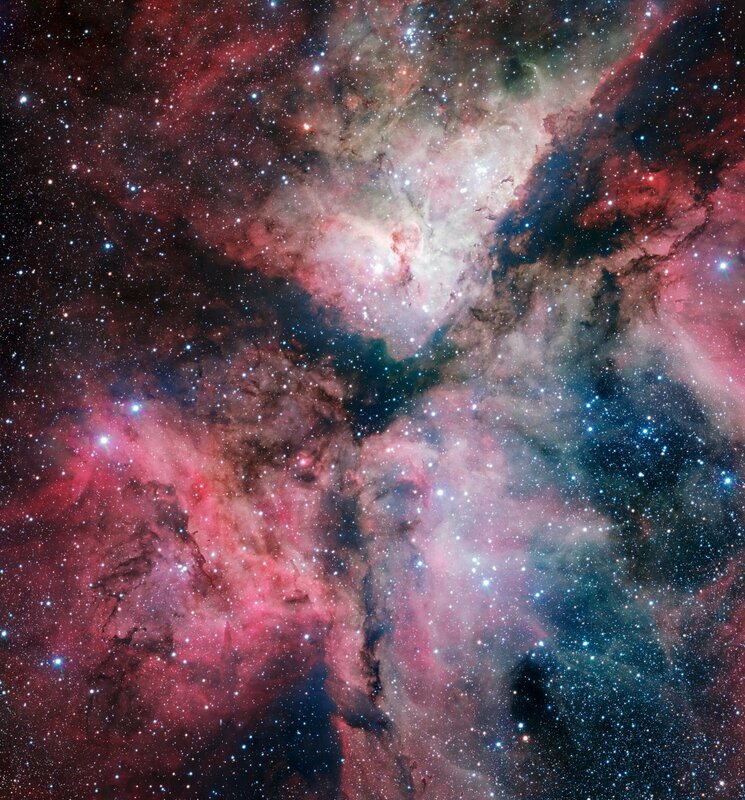 You’d never guess it’s located about 170,000 light years away, 25 times the distance to the Carina Nebula! 30 Dor is one of the largest stellar nurseries known, with some estimates of it having more than 100,000 stars inside. It’s ridiculously complex, as you can tell if you get the 4,000 x 3,000 pixel image, and most certainly if you get the monster 20,000 x 16,000 pixel one. That one will keep you busy for a long time; you’ll see stars being born, stars dying, shock waves compressing material into filaments, and just crazy beauty everywhere you look. I seriously can’t recommend enough you explore it. Hubble: NASA, ESA, ESO, D. Lennon and E. Sabbi (ESA/STScI), J. Anderson, S. E. de Mink, R. van der Marel, T. Sohn, and N. Walborn (STScI), N. Bastian (Excellence Cluster, Munich), L. Bedin (INAF, Padua), E. Bressert (ESO), P. Crowther (Sheffield), A. de Koter (Amsterdam), C. Evans (UKATC/STFC, Edinburgh), A. Herrero (IAC, Tenerife), N. Langer (AifA, Bonn), I. Platais (JHU) and H. Sana (Amsterdam); Chandra: NASA/CXC/PSU/L.Townsley et al. & NASA/JPL/PSU/L.Townsley et al. R Sculptoris is a star in trouble. It’s old and dying. It’s a red giant, a star once like our Sun but now swollen, bloated, and blowing off a dense wind of particles into space. However, it’s not all bad: It has a friend, probably a low-mass star orbiting it. They actually orbit each other, and as R Sculptoris dances in a circle, the wind that blows off from it forms a spiral pattern like a garden sprinkler shooting out water. This picture is actually a slice of three-dimensional data taken by the ALMA radio telescope, a new telescope designed to see cold dust and gas like that blown out of R Sculptoris. I’ll note the details of what this star is doing are fascinating, and I suggest you read the original post I wrote about it. It’s amazing, though, what subtle beauty can be created when a star beings to die. Like R Scupltoris, the star named U Camelopardalis (or U Cam for short) is dying. Unlike R Scul, it’s a solitary star. Its core is going through some pretty epic paroxysms, spasms that episodically eject vast spherical shells of gas into space. 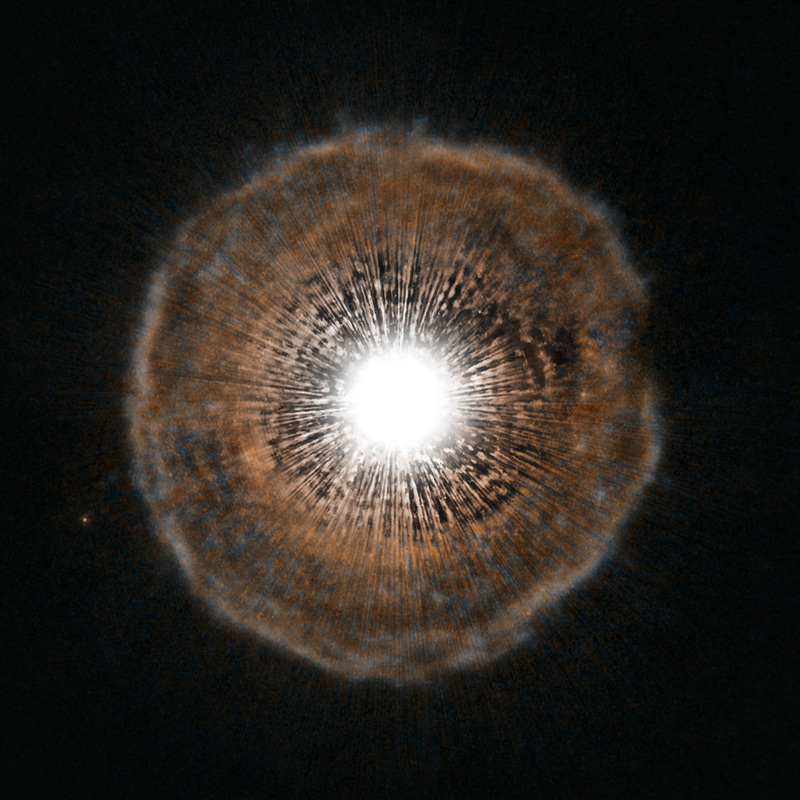 This Hubble Space Telescope image shows the latest shell, ejected just 700 years ago. The amount of material in it is pretty small by stellar standards, just a tenth the mass of the Earth. But it’s enough to make the beautiful and slightly eerie object you see here. I’ll note that U Cam used to be a star very much like the Sun. When you look at it, you may be seeing the Sun’s future, about 8 billion years from now. ESA/Hubble, NASA and H. Olofsson (Onsala Space Observatory).